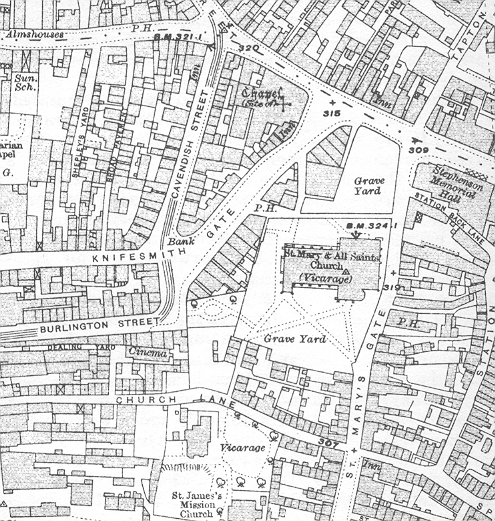 At 7pm on the 4th August a telegram was received at Company Headquarters instructing the Battalion to “Mobilise” at Victoria Drill Hall on Saltergate. 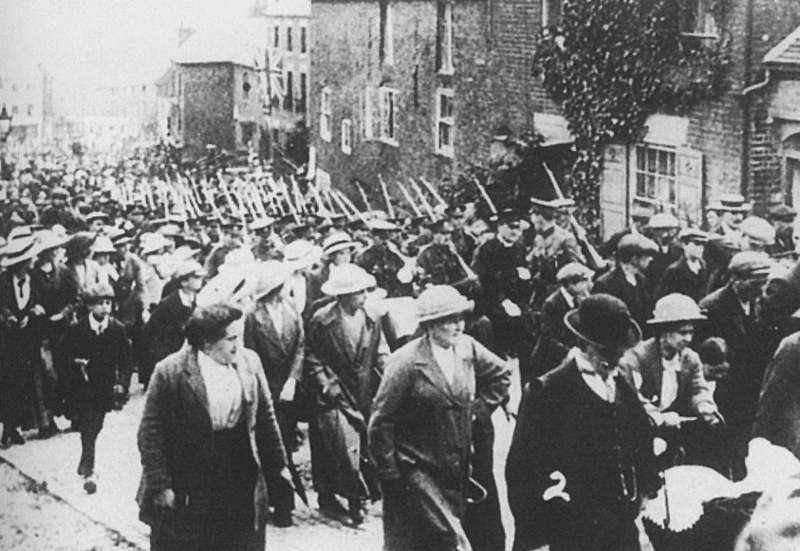 The plan for mobilisation, which had originally been devised by Captain Atkinson and kept up to date by his successor Captain McLomer, quickly became known as “Lomer’s Guide to Chesterfield“. 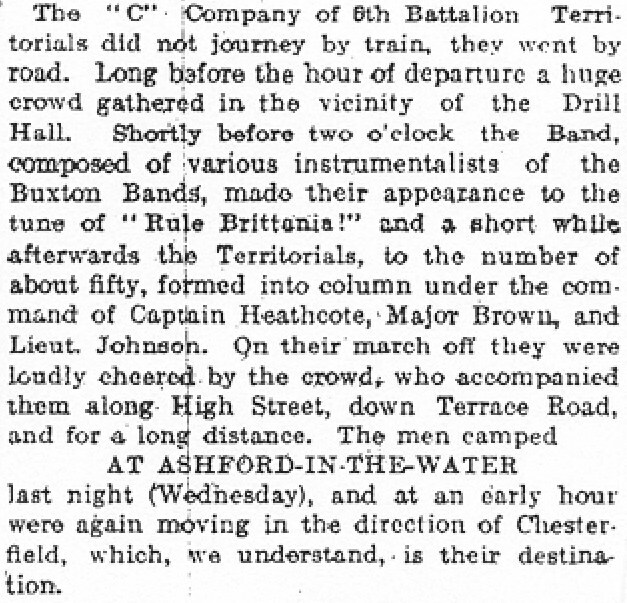 On Wednesday 5th August the Ashbourne Old Volunteer Band led the men out of town and onto the Buxton road. 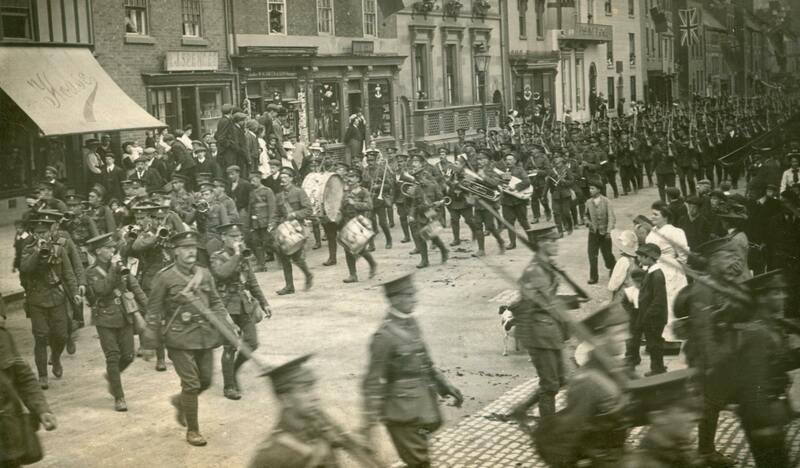 On the second day of mobilisation the men from Bakewell (D Company), Wirksworth (E Compnay), Staveley (F Company) and Clay Cross (G Company) marched into Chesterfield, as did the men from the Buxton half of C Company. 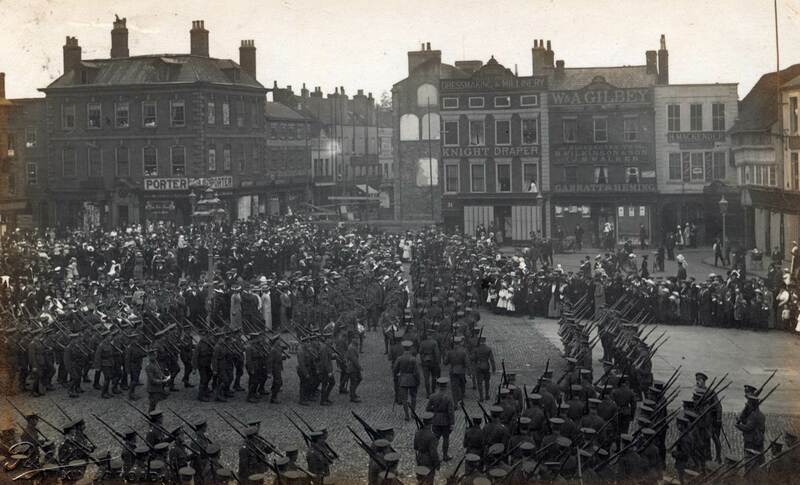 The Companies from Chapel-en-le-Frith (B Company) and Whaley Bridge (H Company) as well as the Ashbourne half of C Company arrived at Chesterfield on the third day of mobilisation. 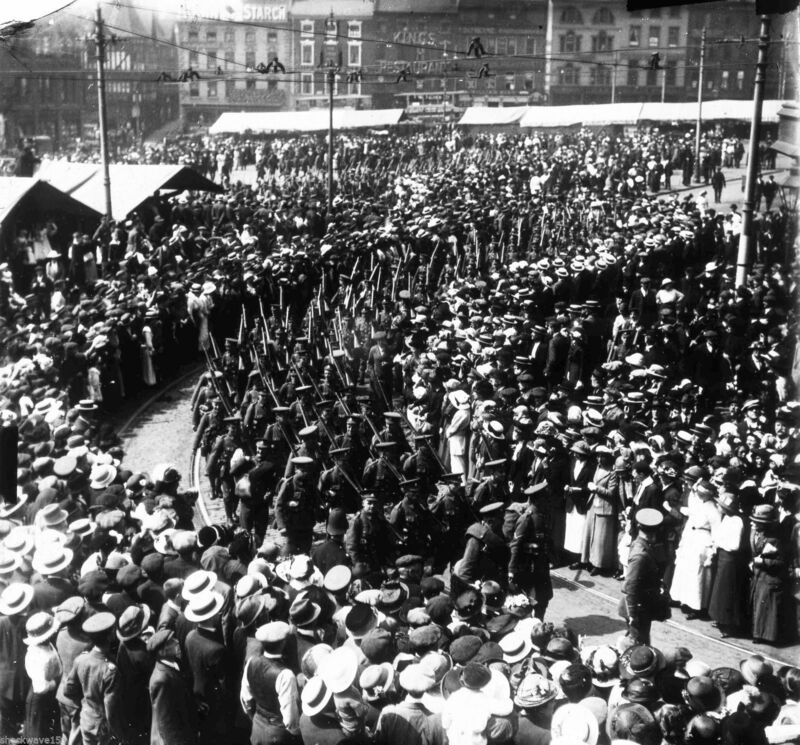 Accommodation for the men was arranged in the Drill Hall and Chesterfield Central Schools, which turned out to be both comfortable and convenient quarters. 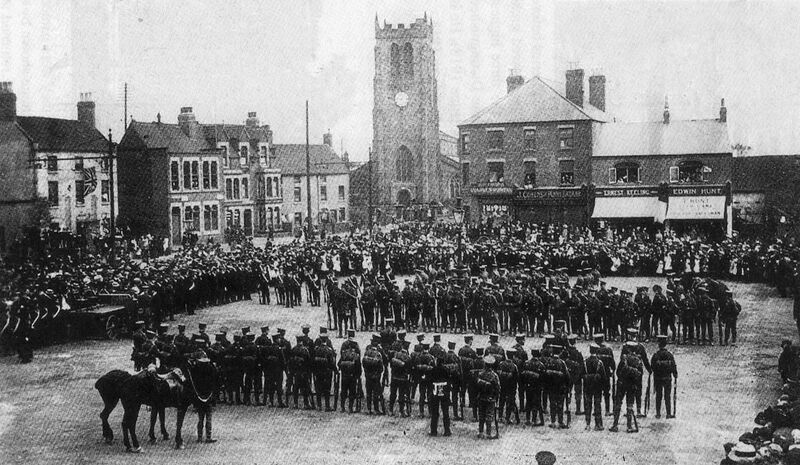 The Battalion Colours were placed in St Mary’s Church (The Crooked Spire) prior to its departure from Chesterfield. 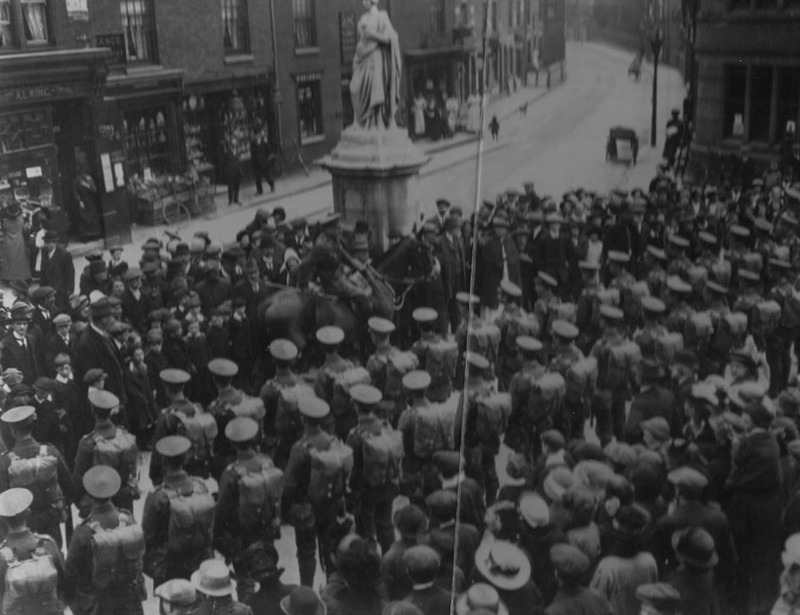 On the 10th August the Battalion marched out of Chesterfield, with Lt.-Col. John Morton Clayton at its head, en route for Derby. 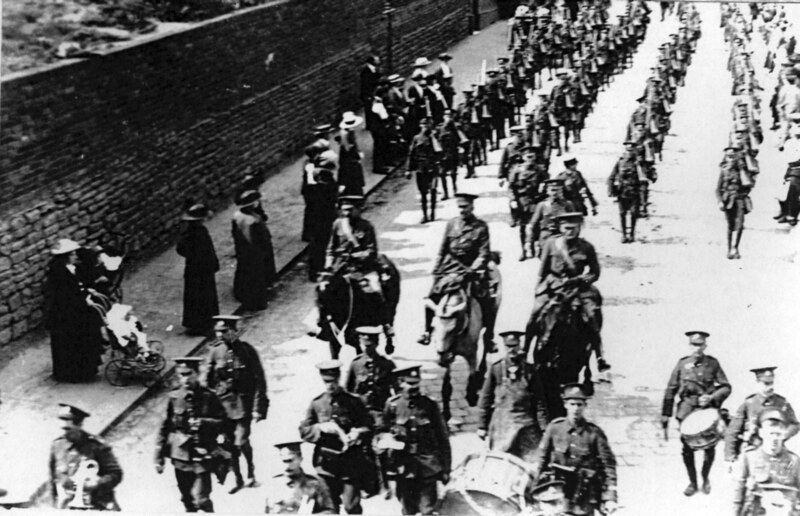 Departure of the 6th Battalion from Chesterfield on 10th August 1914 (unknown publisher). The Battalion are marching along Knifesmith Gate passed Stephenson’s Parade (below); Majors Edward Hall and John Shea seem to be enjoying the attention, whilst Lieutenant Victor Robinson is keeping an eye on the men following behind. The following shops are recognisable: WF Taylor (Grocer), JJ Short (Menswear) and T Furniss (Pharmacist). 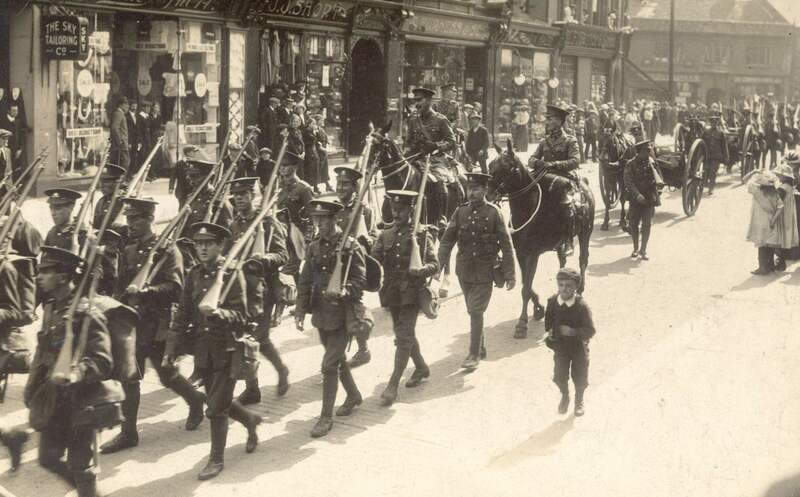 The men are marching down Lordsmill Street on their way to the Midland Railway Station with Colonel Clayton and Major Goodman following the Regimental Band. 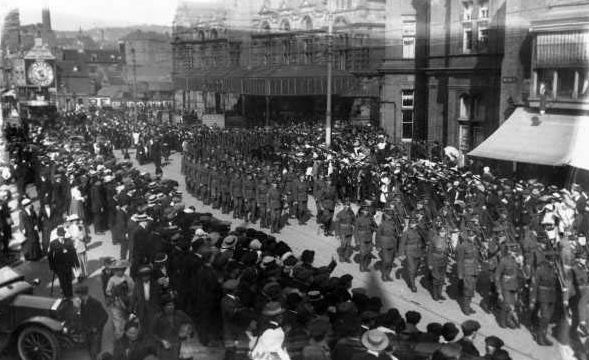 This picture, which is part of the JH Waterhouse Series shows men of the 6th Notts & Derby Territorials preparing for departure possible from the Midland Railway Station. Interestingly the date is given as the 14th September 1914, which was nearly 6 weeks after the Battalion had originally left Chesterfield for Harpenden. 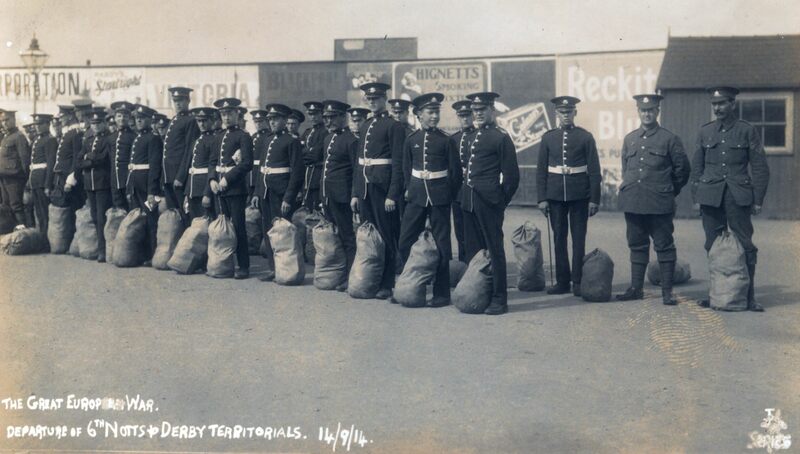 The men are parading in Tunic Order so it is possible that these are former members of the battalion who had reenlisted on the out break of the War, or were the first ‘new recruits’ to the Battalion. Indeed, a group of 62 men who enlisted on the 1st September were numbered alphabetically from 2264 to 2334 and had signed the Imperial Service Agreement at Chesterfield which was witnessed by Captain Welch. 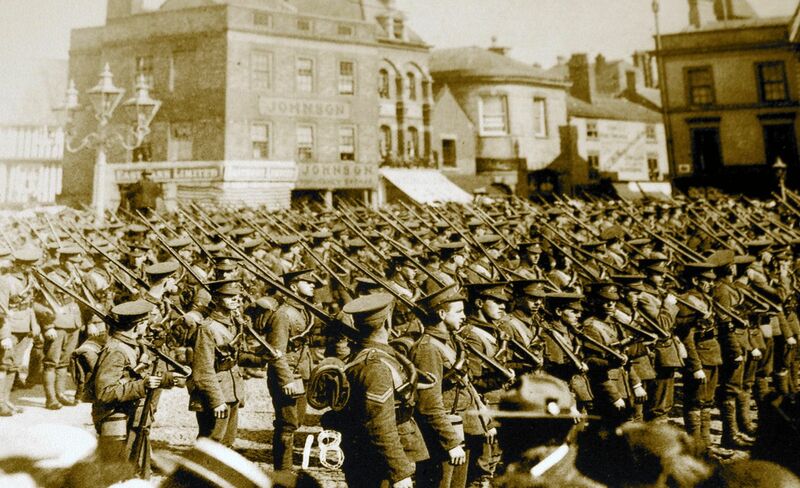 The 8th (Nottinghamshire) Battalion at Newark in 1914 (unknown publishers). 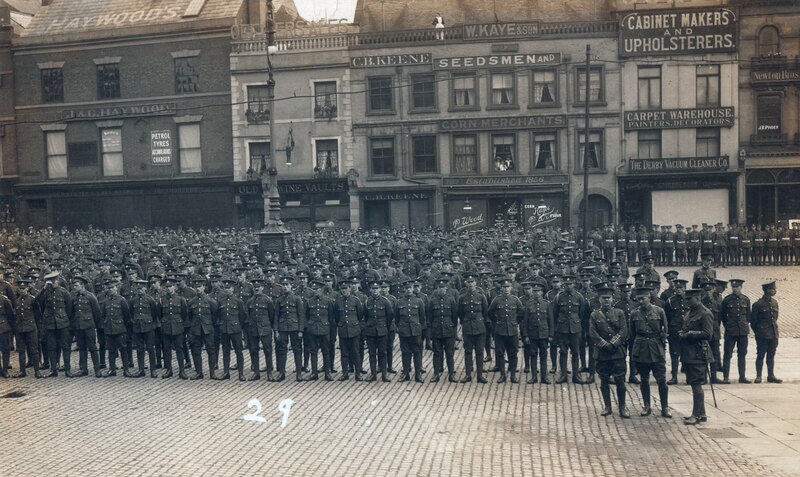 Another picture of the 8th Battalion. Believed to be taken in Mansfield, but there is some uncertainty about this. The Royal Proclamation for the embodiment of the 8th Battalion Sherwood Foresters (Notts. 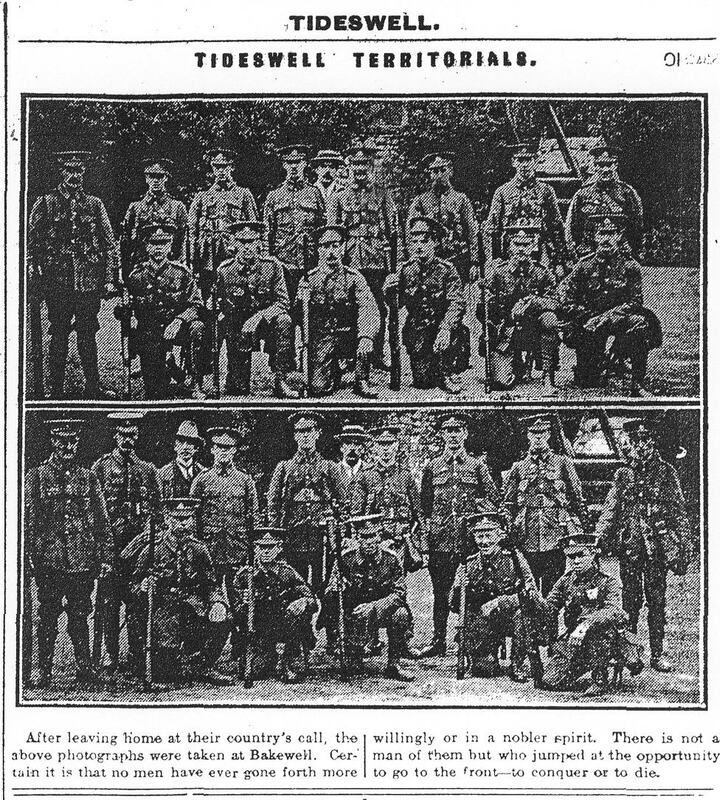 & Derby Regiment) was issued at 6.45 p.m. on Tuesday August 4th and notified to all units in the briefest possible telegram “Mobilise.” The strength of the Battalion on mobilisation was 29 officers and 852 other ranks. On Friday August 7th the Battalion concentrated at Newark, under the Command of Lieut.-Col. C. J. Huskinson, with Major G. H. Fowler second in Command and Capt. E. N. T. Collin, Adjutant. A Company Retford.—Lieut. W. R. Smith, 2nd Lieuts. L. Rose and E. C. A. James. B ” Newark.—Capt. L. C. B. Appleby, Lieuts. C. Davenport and A. H. Quibell. 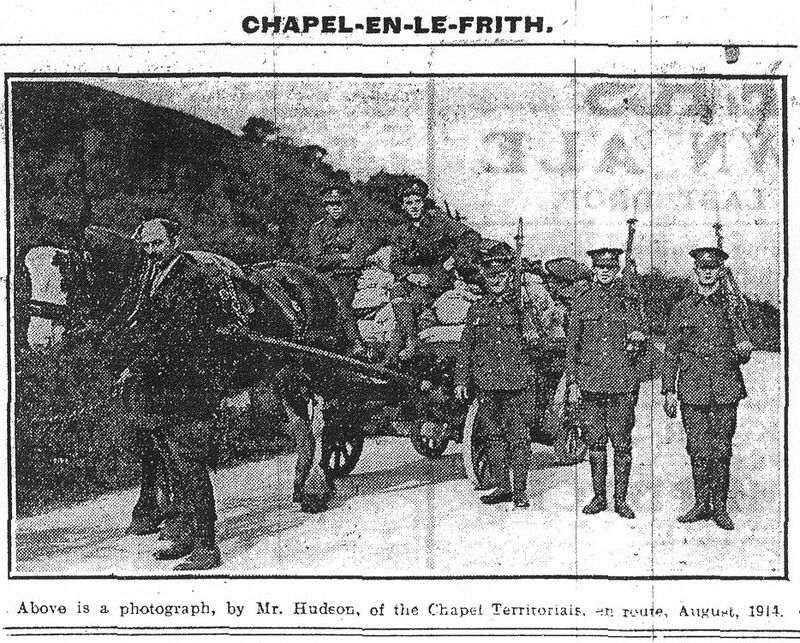 C ” Sutton-in-Ashfield.—Lieut. M. C. Martyn, 2nd Lieuts. H. G. Wright and R. H. Piggford. D ” Mansfield.—Capt. A. C. Clarke, 2nd Lieut. J. W. Turner. E ” Carlton.—Lieut. F. G. Cursham, 2nd Lieut. H. Kirby. F ” Arnold.—2nd Lieuts. G. Clarke and A. F. O. Dobson. G ” Worksop.—Capt. E. W. E. Tylden-Wright, Lieut. W. H. Allen. H ” Southwell.—Capt. J. P. Becher, Lieut. J. K. Lane, 2nd Lieut. H. B. S. Handford. 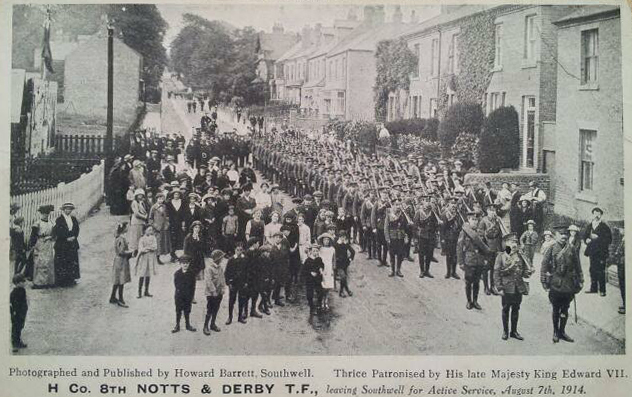 “H” (Southwell) Company, 8th (Nottinghamshire) Battalion leaving the town for active service on 7th August 1914 (Howard Barrett, Southwell). The “Southwell Company” was Commanded by Capt. J. P. Becher, with Lieut. J. K. Lane and 2nd Lieut. H. B. S. Handford.